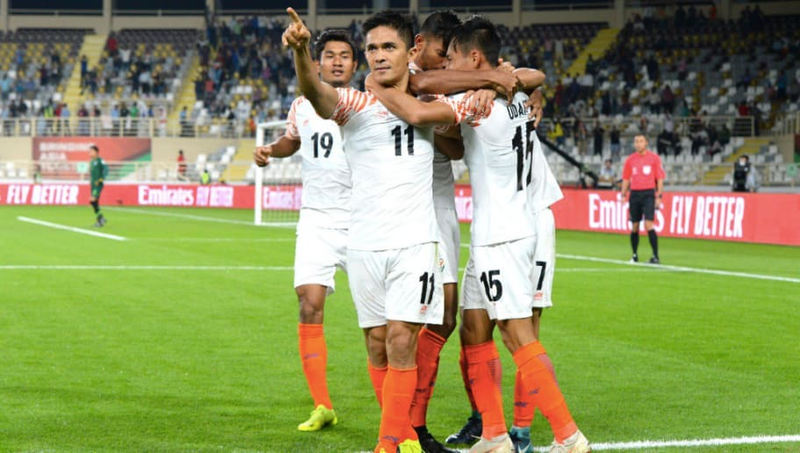 India got their 2019 AFC Asian Cup off to a great start by decimating Thailand 4-1 in their opening encounter at the Al Nahyan Stadium in Abu Dhabi. Sunil Chhetri opened the scoring from the penalty spot before Teerasil Dangda levelled matters from a lovely free-kick. In the second half, goals from Chhetri, Anirudh Thapa and Jeje Lalpekhlua clinched the victory margin. The Indians started the first half on a positive note as they looked to get the ball into Ashique Kuruniyan and Sunil Chhetri as they tried getting in behind the Thailand defence. However, the first chance of the game fell to the War Elephants as Thitiphan's shot flew just wide. Thailand had another good chance shortly after that as a free-kick from a good position saw them get a shot on goal but Gurpreet Singh Sandhu saved the attempt. Immediately after that, India earned a penalty after Ashique's shot was deflected onto Theerathon's arm. Chhetri stepped up to the mark and dispatched the penalty with ease. After the goal, Thailand dominated the ball and ended up scoring through Teerasil's header. Stephen Constantine's men made it through to the break with the scores level but the Indian team that came out for the second half was a completely different side. In the first minute of the second half, Chhetri's pass in open space found Udanta, who went on a brilliant run to cut the ball back for his Bengaluru FC teammate, and the legendary Indian goalscorer made no mistake as he caressed the ball into the goal. The Blue Tigers were very aggressive after the second goal and kept pressing and attacking, looking for the all-important third goal. They got that from another great counter-attack. Chhetri's lovely pass put Udanta through on goal and despite the winger fluffing the chance, Thapa was right there to chip the ball into the far corner. As the Indians made substitutions and slowed the game down, Thailand tried to get forward and create chances but Gurpreet was not troubled on most occasions as the Indian defence held firm. Soon, Jeje Lalpekhlua ended his 10-month goal drought and scored with a lovely finish to make it 4-1. The win, which was India's first in the Asian Cup since 1964, gives them three points and puts them on top of Group A after the first round of fixtures. Sunil Chhetri - 9/10 - The Indian striker led the line brilliantly as he scored two crucial goals and played an instrumental role in setting up the third. He lived up to his reputation as one of the best goalscorers in the tournament. Ashique Kuruniyan - 9/10 - The young man from Kerala was chosen instead of Jeje and he proved it was the right decision. His dribbling and smart runs in behind the defence were a thorn in the side of the Thailand defence all night. Udanta Singh - 8/10 - After a first half in which he was hardly visible, the man from Manipur showed why he is called Flash as his brilliant run helped set up Chhetri for his second. He made the run that led to the third goal, making it a great performance. Special mentions - Anirudh Thapa and Jeje Lalpekhlua for their sublime finishes.